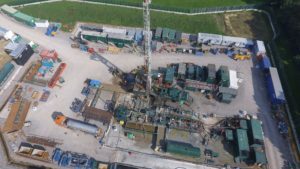 Did UKOG use matrix acidising? The UKOG statement implies that matrix acidisation may have been used at Broadford Bridge. A coiled tubing unit was used at the site, which could indicate that the process was carried out. But a company review of the Broadford Bridge operation said “acidisation was not selectively administered to any specific limestone horizon”. Drill or Drop asked UKOG twice to clarify whether or not it carried out matrix acidising at Broadford Bridge. UKOG did not reply. Did UKOG have permission to use matrix acidising?